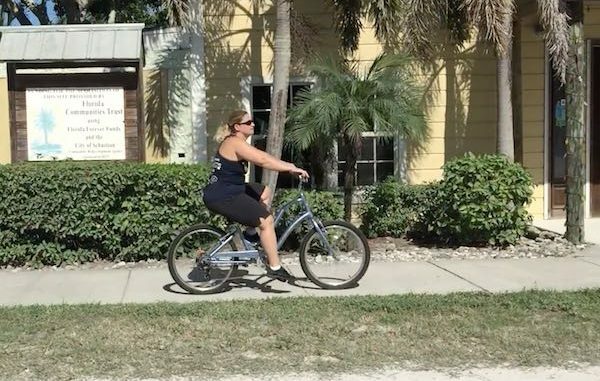 HomeCommunityAre bicycles allowed on sidewalks in Sebastian? Human propelled bicycles are allowed on sidewalks in Sebastian, Florida. So, we reached out to the Sebastian Police Department for answers. “This is a question that regularly comes up. Bicycles that are human propelled can be operated on the sidewalk or the roadway,” Lieutenant Timothy Wood told Sebastian Daily. Propelled doesn’t mean motorized, only human propelled bicycles. Lt. Wood said the operator of the bicycle has to yield the right-of-way to any pedestrian and needs to provide an audible signal before passing a pedestrian. Also, if a bicycle is on the road and there is a lined bicycle lane, they are to use the designated lane. If a bicycle lane is not there, they are to ride as close as possible to the right-hand edge of the roadway. “The only exceptions to this are when the bicyclist is overtaking another bicycle or vehicle going in the same direction, they are preparing to make a left turn and when having to go around a ‘conflict’ which is impeding their path of travel,” said Lt. Wood. Also, it is important to remember that any human propelled bicycle utilizing the road, has all of the same rights and duties as all other vehicles on the road. All of this information falls under Florida State Statute 316.2065. The violations are going to be around $46; however, may vary depending on the violation and the possibility of additional court costs.